The Audio Images show home covers many aspects of what you should consider if you are building a new home or extensively refurbishing your existing one. If you are considering such a development then we would be happy to show you around. Please get in touch with Rick Weldon to discuss your plans. We have extensive lighting control using AMX Rania lighting dimmers. These are located in several ‘technical cupboards’ around the property which reduces the cable runs to the light fittings. 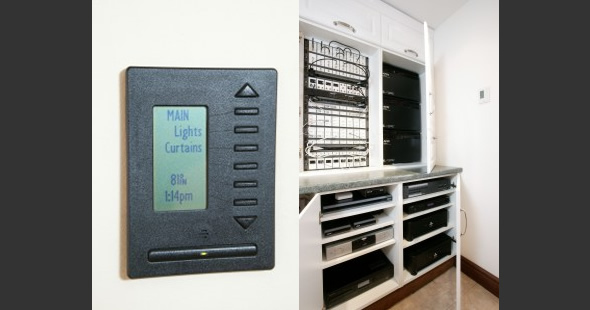 As all the technical cupboards are interconnected with a single data cable it still allows any button on any keypad or touch panel in the house to be able to select a light scene in any room. Extensive use of external PIR detectors connected into the lighting control system allows the outside lights to illuminate where you are, and where you appear to be heading, rather than the entire house and grounds. Streetlights are set to turn on half an hour before dusk and then off at midnight. An Astronomical clock in the control system calculates Dusk and Dawn times each day automatically as well as adjusting itself for daylight saving twice a year. Speakers fitted in the ceiling of each room enable music to be played throughout the house. Control of the volume, source and track selection varies from room to room, from AMX DMS keypads to AMX touchscreens. Each room is fitted with electrically operated curtains or blinds. A good use of which is in the lounge which has a large arched feature window. Two curtain tracks run in front of the window, one fitted with a curtain, the other with a voile. This allows the sun to be screened on a hot summer day, but still allow the view to be appreciated. The dress curtain is then closed in the evening. A single button on the bedroom touch panel allows all the curtains and blinds to be closed at night.